Scan the USB devices against viruses"
USB drives are valuable accessories to laptops and PCS. However, these little pen drives are also a common way of transferring virus infections from one computer to another. Unfortunately, some antivirus does not automatically scan drives upon insertion causing the computer to get infected before the antivirus can take action. USB Virus Scanner is a free utility that proffers a lasting solution to infections from USB drives. The tool automatically prevents worms and viruses from accessing the computer from the USB drive when it is inserted. The program then proceeds to scan the drive and blocks or delete all malicious files detected. Typical among these class of malware are the ones that change the permission on folders, hides them or converts them to malicious executables. These types of viruses make it impossible to open a folder by double-clicking. It is a lightweight program which uses minimal memory and processor power, so it does not have a negative impact on the performance of your computer. It quietly runs in the background but swings into action whenever the user inserts a USB drive. The developers claim that the application can permanently protect the computer from all USB drives infections without the need for the update of virus signatures. It is part from antivirus category and is licensed as shareware for Windows 32-bit and 64-bit platform and can be used as a free trial until the trial period will end. 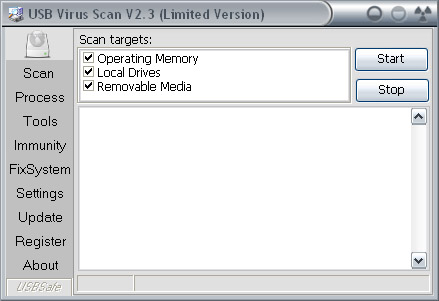 The USB Virus Scan demo is available to all software users as a free download with potential restrictions compared with the full version.